The Cognacq-Jay Museum, le musee Cognacq-Jay, gets it's name from Ernest Cognacq and his wife, Marie-Louise Jay, founders of the grand department store, La Samaritaine. Upon his death in 1928, Ernest Cognacq gifted their collection to the City of Paris. It was originally located in the Cognacq residence at 25 boulevard Capucines. 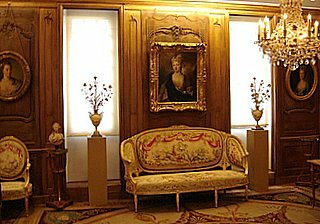 The Cognac-Jay Museum was moved to the Hotel de Donon in 1990, which was built in 1575 by Mederic Donon, the Controller of Buildings for Henri III. 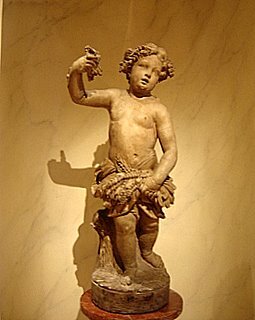 The Museum Cognacq-Jay collection, created between 1900-1925, is mostly French art from the 18th century. It contains art objects, ceramics and porcelains, furniture, sculptures and paintings including many portraits. There is also a collection of bejeweled snuff boxes and inlaid cigar-cutters. 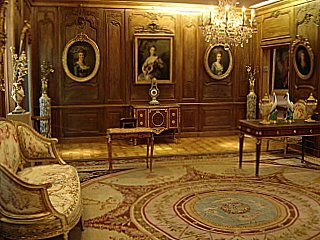 Some rooms are re-creations of the salons from the Cognacq residence, complete with furniture and rugs, chandeliers from 1750 and wood paneling from 1740. The garden in the back of the building is available for visiting and a visit to the attic is especially impressive for viewing the original and exposed roofing beams of the building. This is a small museum of a specific period of art. One is impressed with the sense of having visited the 18th century, albeit in a 16th century mansion. Although there is no fee for visiting the permanent collection, there are temporary exhibits on occasion that require payment of a fee, usually about 4 euros. The museum is open from Tuesday-Sunday 10:00 a.m.-6:00 p.m. with the last admission at 5:30 p.m. It is closed on Monday and holidays. Admission is free to the permanent collection. A fee of 4 euros is required for the temporary exhibit. A coat-check is available as well as a small book-store. Photography is allowed without the use of a flash.